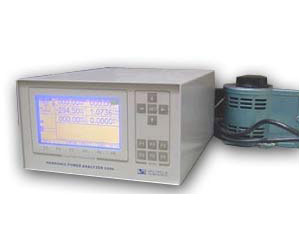 The Valhalla state of the art 2400 Series Power Analyzers offer high performance in both single and three phase. Unlike other instruments at this price level the 2400 is designed to operate with extreme signals generated on frequency inverter drivers. These analyzers provide precise reliable measurements for any waveform. Large clear monitor lets you read displayed values from a distance of four meters. Checking power to determine the pertinent power parameters of a frequency inverter driven system is simple. All values display large letters easily read even in dark rooms. The user menu makes operation easy. The new 2400 power analyzer measures, computes, and displays all of your critical power variable to let you concentrate on more efficient reliable testing. It is available in single or three phase versions and combines a wattmeter, oscilloscope, and a power spectrum analyzer in a single compact package. From the simultaneous and precise voltage and current measurements, you can measure and monitor all of the power parameters you need. You can display them in the format that fits your application.